Sand Drag Central • View topic - Does anybody have pictures of..........???? Does anybody have pictures of..........???? Re: Does anybody have pictures of..........???? sandaltered wrote: Here it is. Pretty Sharp. 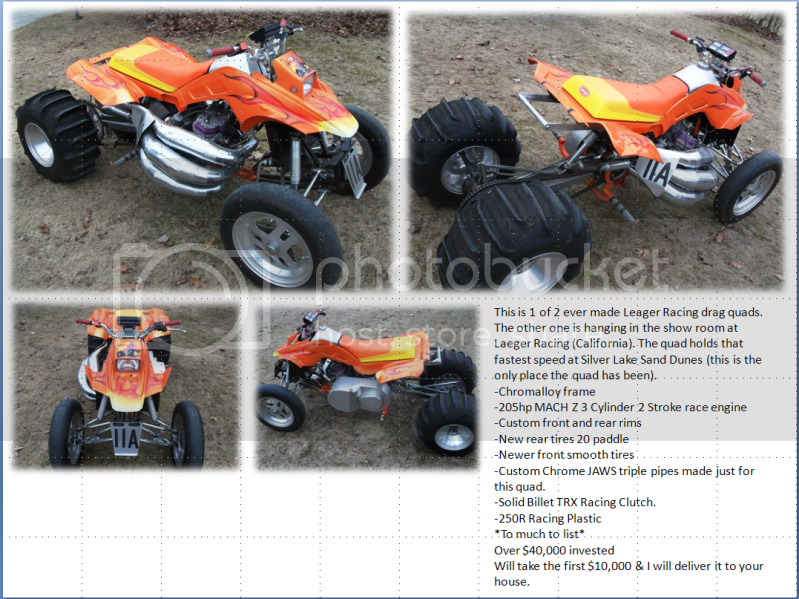 Well,I would bet $$ thats SAMS OLD Quad! It wasnt painted like that when he owned it,but its either the SAME Machine or its been CLONNED! Ill let tony call sam but I'm willing to bet this is one of sams old quads. He used to go with orange always and always had flames and something similar looking to what is on the front hood of this bike on all of his bikes. The bike on my shirt was black. That's what threw me off. The guy that owns it now is named Dave. His son-in-law is who I spoke to about it at work and he said his father-in-law built it and has been the only owner. Could be a super close clone. Anyway, it's a super neat looking bike. Very clean. Kristy says it is Sam's old bike, she said they printed tee shirts from Duneland with Sam on the bike on the back of the shirt. she said Sam's did see the pics, he confirmed it is his old bike with differnt plastic. Sweet. My selective memory is still serving me well. may be a museum piece, the first or second sno mo quad?